I would like to thank FTRichter for the use of assets from his mod, Meowmaritus for making Param Vessel & TextVessel - Text Data Editor and Wulf's MSB Editor. -Bleed: Reduces physical defenses for a short time. -Enemy Changes: Enemy hit colliders fixed. -Corrupted Blood Mass (Dung Pie): Now deals bleed buildup. -Soulcutter (Server): Drains health on hit, deals increased critical damage, and regenerates health. the safe fall buff for a short duration. -Rapier of Antioch (Rapier): Increased base damage, critical damage, and thrust counter damage. equip, and increases damage when below 50% health. recieved when below 50% health. -The Immovable (Greataxe): Increases poise, increased base damage and physical defense. -The Torment (Morning Star): Deals toxic, increased base damage and bleed buildup on hit. -Treetrunk (Great Club): Increases elemental resists, increased base damage and poise. increases max stamina, and increases damage when below 50% health. -Demon Ruins/Lost Izalith: Fixed boss bonfire not working. -Enemy NPCs: Updated stats, weapon sets, and armor sets. -Fire Weapon Buff: Increased damage to equal that of the thunder damage effect. -Armor Sets: Armor sets have been reverted but now give extra bonus when upgraded. Titanite using sets can now go to 10, Twinkling titanite sets can now go to 5. -Armor Sets: Most armor sets can now be upgraded. Titanite using sets can now go to 15, Twinkling titanite sets can now go to 10. -Water: No longer creates a slow effect. -Mud: No longer creates a slow effect. -Tar: No longer creates a slow effect. - Poison Swamp: No longer creates a slow effect. -Chimeric Swamp: Creates a poison effect. -Rusted Iron Ring: Increases elemental resists. -Fixed soul level progression bug. -Fixed NPCs randomly dying bug. -Sens Fortress: Removed titanite demons, added more fitting enemies. 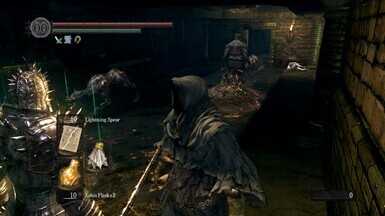 -Undead Parish: Removed titanite demon, added a more fitting enemy. Changed boss music for most boss fights as well as firelink shrine. Health: You can now level up your health to 98 without diminishing returns. 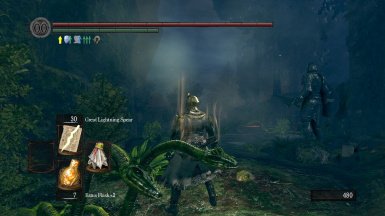 Darkroot Garden: Reduced number of stone guardians. of thorn killed in The Depths. -Astora's Straight Sword: Reduced stats requirements, added evil eye effect. -Silver Knight Straight Sword: Added faith scaling, increased strength scaling, added base thunder damage, and gives thunder resist when equipped. -Silver Knight Spear: Added faith scaling, increased strength scaling, added base thunder damage, and gives ring of sacrifice effect when equipped. -Added new enemy locations in the DLC areas. -DLC Enemies: Adjusted physics and damage types. -Stone Guardian: Reduced physical defense & increased strike vulnerability. -Covenant of the Abyss: Fixed magic resist not working. -Blue Tearstone: Fixed effect not working. Dark Basin: Added new enemy locations and updated npc enemies. Demon Ruins/ Lost Izilith: Added new enemy locations and updated the boss fight. Armored Tusk: Reduced physical defense, added weak to thunder and strong to magic. Four Kings: Increased hit radius. Black Knight: Can no longer be back-stabbed. -Added new enemy placements in Hollow Tree & Ash Lake. -Added new enemy placements in Undead Asylum. -Added new enemy placements in Tomb of Giants. -Added new enemy placements in the Catacombs. -Added new enemy placements in Firelink Shrine. -Added new enemy placements in The Depths. -Added new enemy placements in Undead Burg/Parish. -Enemies that deal fire or thunder now show that effect when they hit you. -Added additional damage types to appropriate enemies. -Drakes are now weak to thrust damage. unfortunately for them, the drakes devoured them and have created a nest within the city. -Updated ai and aggression range. -Black Knights now zealously guard Gwyn. Demon's Great Hammer: Added a strength scaling and fire damage effect when equipped. Butcher Knife: Added s strength scaling and bleed effect on hit. Gargoyle Tail Axe: Added c strength scaling and fire damage effect when equipped. Crescent Axe: Added s faith scaling and thunder damage effect when equipped. Black Knight Greataxe: Added a strength scaling and thunder damage effect when equipped. Black Knight Sword: Added a strength scaling and thunder damage effect when equipped. Black Knight Greatsword: Added a strength scaling and thunder damage effect when equipped. Priscilla's Dagger: Added magic damage effect when equipped and hornet effect. Velka's Rapier: Added magic damage effect when equipped. Ricard's Rapier: Added s dexerity scaling and great magic damage effect when equipped. Astora's Straight Sword: Added magic damage effect when equipped. Balder Side Sword: Added s dexerity scaling and fire damage effect when equipped. Barbed Straight Sword: Added a dexerity scaling. Darksword: Added a strength and a dexerity scaling and base magic damage. Demon's Greataxe: Added fire damage effect when equipped. Demon Great Machete: Added fire damage effect when equipped. Washing Pole: Added a dexerity scaling and thunder damage effect when equipped. Gravelord Sword: Added s dexerity scaling and greater toxic effect when equipped. Server: Added a dexerity scaling and hornet effect when equipped. Demon's Spear: Added thunder damage effect when equipped. Gargoyle's Halberd: Added fire damage effect when equipped. Giant's Halberd: Added thunder damage effect when equipped. Titanite Catch Pole: Added c strength scaling and crystal magic damage effect when equipped. Notched whip: Added s dexerity scaling, base fire damage and fire damage effect when equipped. convent, pvp, and ng+, you can now buy them from Petrus at Firelink Shrine. The Depths: The knights of the thorn have established a hideout in the area. Darkroot Basin: Heroes from distant lands have heard of your intent to desecrate Artorias's Grave and have arrived to defend it. The Catacombs: Paladins have been sent to rescue Rhea from the tombs and will destroy anything in their way. The Tomb of Giants: Vince and Nico have grown in power. Anor Londo: Iron Tarkus has joined the Darkmoon Knights in defending the city of the gods. 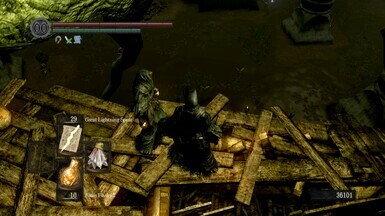 New Londo: A group of renegade mages have traveled to the city and joined the darkwraiths in learning the mysteries of Life Drain. The Dukes Archives: Crystal generals have been released from their vaults to combat your violation of Seath's domain. The toxic dart blowers in Blighttown have been annihilated and the true heirs of the swamp have returned. 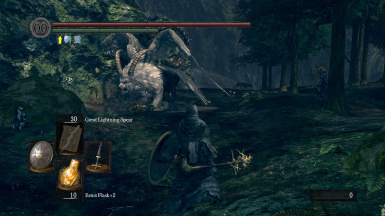 Increased soul gain from DLC enemies. Fixed the DLC portal not working. Fix aggression range of certain mobs. 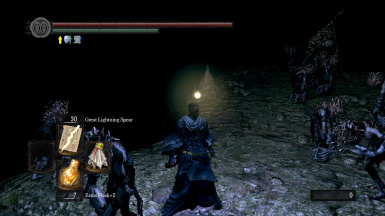 Titanite Demon: Guard break stamina reduced. -Side Note: This mod is only for veterans who want an extreme challenge. -Mod has been updated to V.9.1, see the Changelogs for details.